Years ago, on our first trip to Belize, a Belizean from San Ignacio who had befriended us took us out for supper at the Aguada. We spent a very pleasant few hours there, surprised that such an attractive hotel existed outside of down-town San Ignacio, impressed by the art work on the walls, pleased with the menu that offered a tasty combination of Belizean and North American food, delighted by the sparkling pool behind the restaurant and astonished at the reasonable price of the rooms. We determined then and there to return on our next visit and we did. We met the Butcher family, the entire staff from maintenance to housekeepers to servers and had a wonderful time. It immediately became an automatic destination on any trip to Belize. 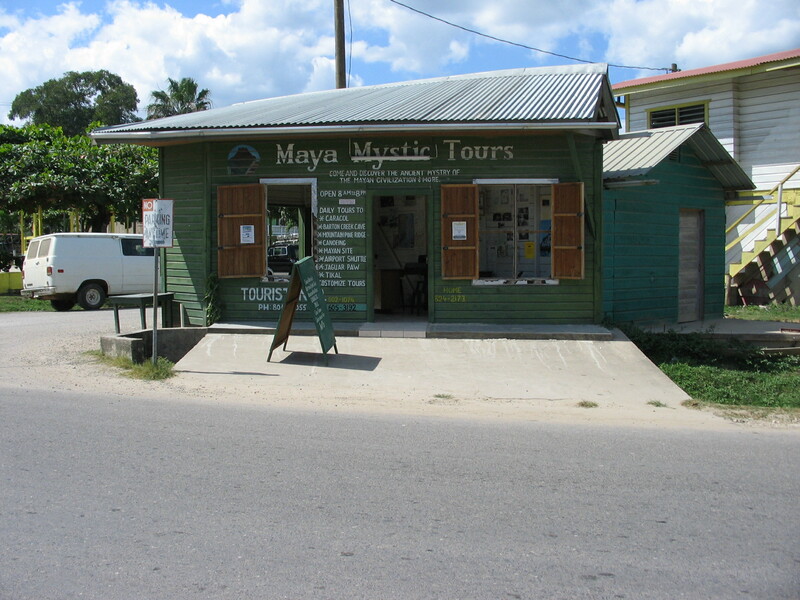 Until a couple of years ago, when we realized that after many trips to Belize traveling from hotel to hotel, mostly by bus we had to cut back on our itinerary and spend more time at fewer places. We eventually narrowed our visits down to two: the Aguada in the rain forest area of the Cayo District and Oasi Apartments on the island of Caye Caulker in the Caribbean Sea. This year we had the most relaxing time ever. The Aguada Hotel is, strictly speaking, in the town of Santa Elena, a town twinned with San Ignacio, like Kitchener/Waterloo in Ontario or Minneapolis/St. Paul in Minnesota. The twin towns are divided by the Macal River and both are in the Cayo Region which is in-land in the rain forest and borders on Guetamala. The Hotel was owned and managed by an American/Belizean couple, Bill and Cathy Butcher; they have since retired, which is another way of saying they are very busy doing other things and their daughter, Shalue, has taken over. Shalue is a bright, hospitable and high-powered host whose first and foremost concern is the welfare of her guests. In that respect, she follows in the footsteps of her parents. But in other ways, she had brought a new energy to the Aguada. ‘Aguada’ itself is a Spanish word meaning ‘the watering hole’ and many years ago it was used by cattlemen who brought their herds of cattle there for a drink of water. The Butchers built their hotel beside it and it can be seen today as a spring-fed water-hole stocked with fish and alive with frogs and turtles. Trees from the rain-forest ring the watering hole and the trees are alive with the songs of many different kinds of birds. The hotel is well run and spanking clean. The pool is rigourously maintained on a daily basis. The rooms are large and bright, cleaned daily and with great care, and the bathrooms have ceramic tiling with modern fixtures. And the prices are still very reasonable, ranging from $60.00 for a couple to family units available at $65.00 and new junior suites at $75.00 or more. (You best check on-line for room prices. )Budget-priced rooms are also available on the main floor. Several years ago, three more units were built apart from the original hotel complex with verandahs facing the watering-hotel. That is where we stayed on our last 3 visits. And that’s where we stayed upon our return. 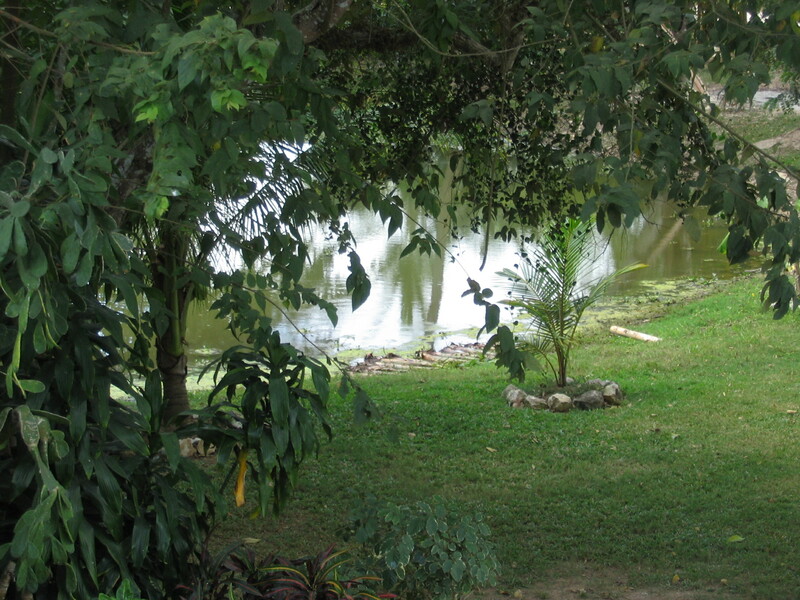 It’s more secluded and a perfect place to watch for iguanas which are very plentiful at the Aguada. You can take all your meals in the hotel restaurant if you wish. The meals are reasonably priced and the food (and service) is exceptional.You can dine inside or outside under a palapa overlooking the aguada. On special occasions, especially Valentine’s Day, be prepared for an extravaganza. On top of all this, when you stay at the Aguada you become part of the Butcher extended family. If you have a problem, as we did one year with our luggage, the Butchers will step right up and help you solve the problem. They have contacts across the country and will use them if necessary to set things straight. Check out Martha’s Guest House, smack downtown just off Burns Ave. Seems to have a very good reputation and a good restaurant attached. We’ve been told it has a couple very nicely appointed apartments at a good price. Definitely worth looking into. Then there are the more budget-minded hotels like the Hi-Et (get it?) 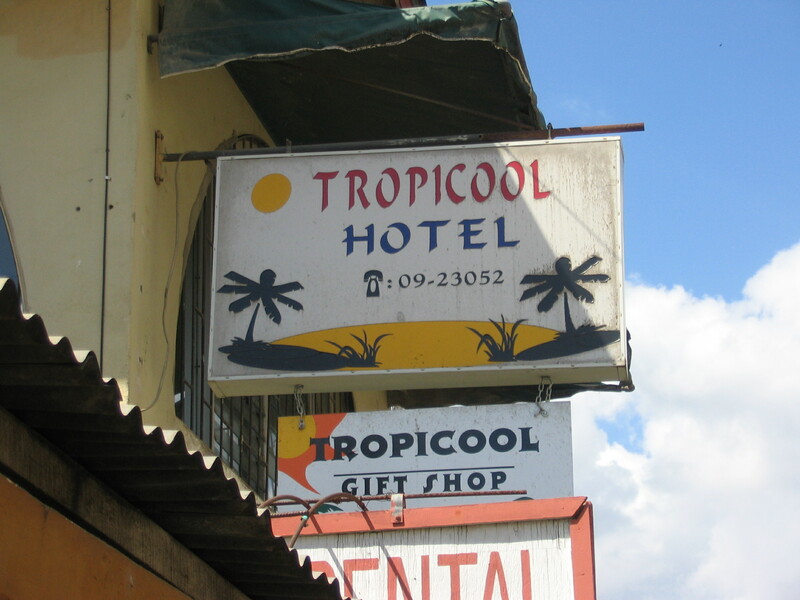 Guest House, The Tropicool, Vern’s, Central and Richies. Rooms at around $40.00 usd with shared bath. Check them out. 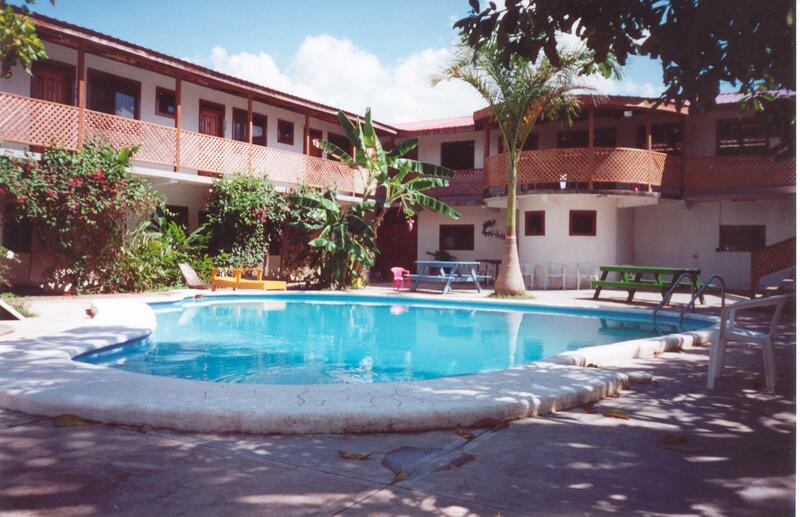 If you are looking for a high-end hotel at high-end prices, check out the San Ignacio Hotel. It has a swimming pool or two, a casino and an iguana sanctuary rolled into one. If a resort is more to your liking (i.e. a place where you are lodged on a compound and take your meals there), there are many such places outside of San Ignacio/Santa Elena offering attractive accommodation packages not to be mistaken with all-inclusive resort hotels in places like the Dominican etc. There is nothing quite like that in most of Belize so make sure you know exactly what you are going to get before you commit. These resorts often specialize in one activity like horse-riding, bird-watching or hiking and rafting, so get on line and see what you can find out. 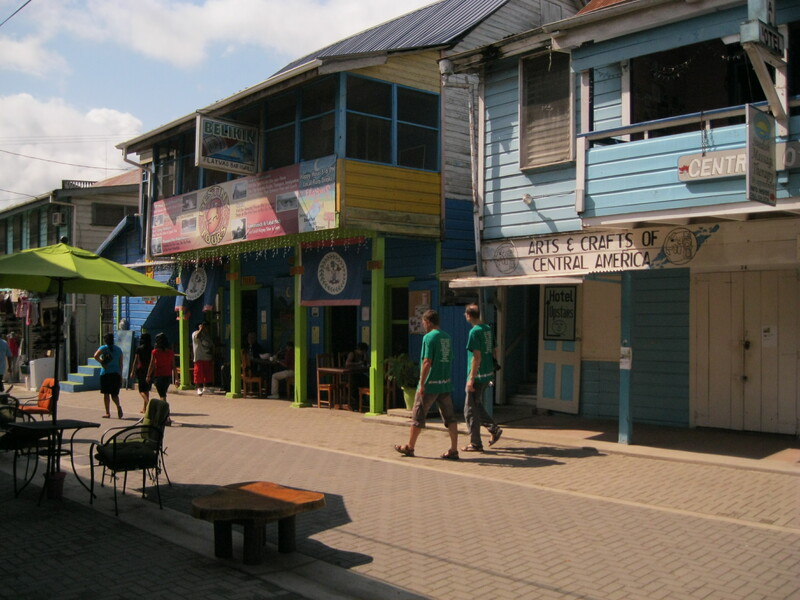 San Ignacio offers great opportunities for day-trip adventures. We have visited all the local Mayan ruins, nowadays more appropriately called ‘sites’. Xunantunich (Maiden of the Rock) was our favourite site until the road was improved and we could access Caracol (the Snail) without permanently damaging our spines. Now it is our number 1. We have canoed an underwater cave system called the Barton Creek Cave. Our son took his young family down the Macal River on rubber tubes. And, we’ve heard from many travelers that their ultimate jungle (rain forest) adventure is the day-trip to Acton Tunichil Muknab. Check it out. Or, you can go on-line and search for tour companies in San Ignacio. Or you can wait until you arrive in San Ignacio and have checked into your hotel before you start shopping for a tour guide. Head right downtown to Burns Ave where you will find many reputable tour companies. Check them out and make your choice. You can’t do everything in a short period of time, so you have to decide how many activities you want to take on and how much time you want to spend exploring San Ignacio or just lazing around the pool with a good book, a cross-word puzzle or a sudoku. Your biggest problem will be to decide which of the many adventures you want to pack into your vacation, or how few. At first, we found a couple trips a week suited us, but, as we visited again and again, we tripped less. Now, more often than not, we start the day with a walk into San Ignacio (about half an hour if you take the short cut), walk around town for awhile (San Ignacio is a bustling town of approximately 7,000 Belizeans, many of whom are Indian, Mayan or Spanish descent), maybe have some breakfast, shop around, then head back to the Aguada and the pool. For lunch we may share the Aguada’s famous Nachos Supreme, a scrumptious dish made up of fresh nachos, cooked ground beef, hot melted cheese liberally sprinkled with hot halapeno peppers accompanied by a cold Belikin beer. After that, depending on how hot it is , we generally go out for another walk or relax for the rest of the day. By nightfall, around 7:00 p.m., we might take a cab into San Ignacio for supper or eat in, chat with the server or fellow travelers, and go back to our room to read or write or sit out under the palapa or on the verandah for a night cap till it’s time for lights out. Very easy living, but I daresay that you will be as adventurous as we once were. 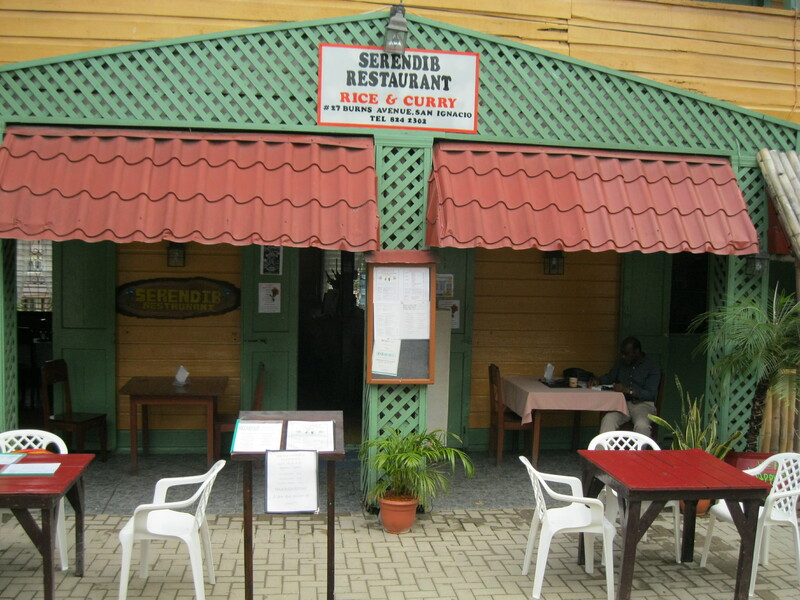 For restaurant food, try the Serandib, formerly a Sri Lankan restaurant still famous for delicious curries and Belizean food and one of the most popular hot spots on Burns Ave. in downtown San Ignacio. There are and many other well-established restaurants such as Pop’s and Hanna’s on or near Burns Ave., the main drag. Up the hill, you will find Sanny’s, a little hard to walk to but very good food and you might also check out Hode’s Place and the Business Lounge at 48 Baymen in San Ignacio. And here is a newsflash. Check out Craves a block behind Burns Ave. It’s quite new and quite pricey but the favourite of many of our friends. We didn’t hear about it till it was too late to visit…but next year. There is a great bakery by the recently opened civic park. 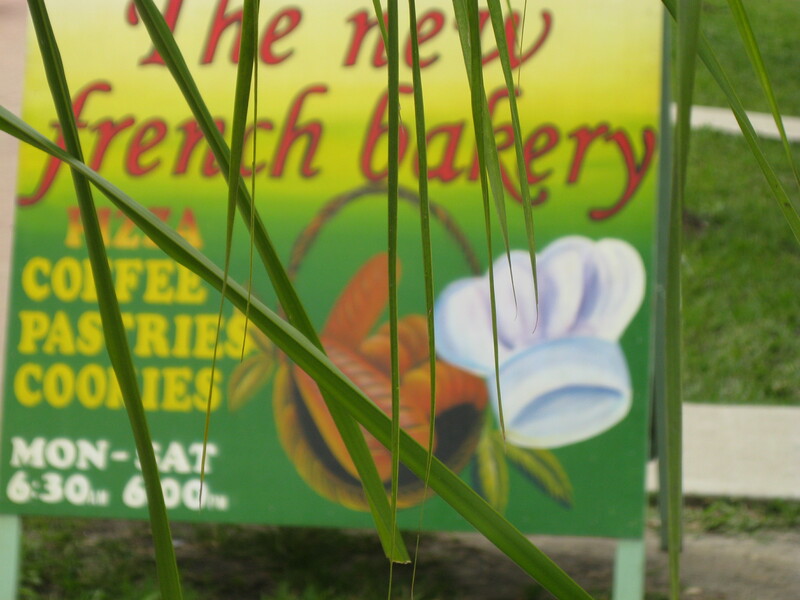 Try their fresh-baked bread and tasty pastries and cookies and sausage in a bun. Especially on the weekends you can get out on the street and buy bar-b-q-ed chicken with cole slaw or potato salad on the side, and at any time around town you will discover kiosks with quesidillas and other Spanish/Mexican delights such as garnaches, enchiladas, tortillas, and tamales. If you stay at the Aguada in Santa Elena, a 10 minute walk to the Western Highway will get you at least two Chinese Restaurants with very good and inexpensive Chinese food for eat-in or take-out back to the hotel. Or, of course, you can eat at the Aguada three meals a day, except Wednesday when it is breakfast only and chef’s night off. There is so much to do if you wish and so little to do if you want to. By the end of your visit inland to San Ignacio/Santa Elena, you should be leaving Belize with some very fond memories and a belly full of stories for family and friends. This entry was posted on Saturday, September 29th, 2012 at 1:56 am	and posted in adventure, Travel. You can follow any responses to this entry through the RSS 2.0 feed. It is, Nic, it is. Good to hear from you again.